Londonderry Pediatrics is dedicated to providing pediatric care to our families in Londonderry and surrounding communities, from birth into early adulthood. Our experience as physicians who only treat children allows us to identify and treat those ailments which specifically affect children. The care of your family generally begins with newborn services (but can begin at any age), and continues through your child's college years. Our pediatricians, Dr. Kerry Houston, Dr. Chris Peterson, Dr. Shanon Gruchot, and Dr. Matthew Desena are certified by the American Board of Pediatrics and take a family centered approach to medicine. Whether sick or well, our goal is to try to have each child see the same physician at each visit, building a special relationship between your child and his or her doctor. We take pride in taking the time to listen to you and your concerns, realizing that no one knows your child better than you do. We understand that your child may not be sick only from 9 to 5. Knowing this our office has extended hours to better serve you and the needs of your children. 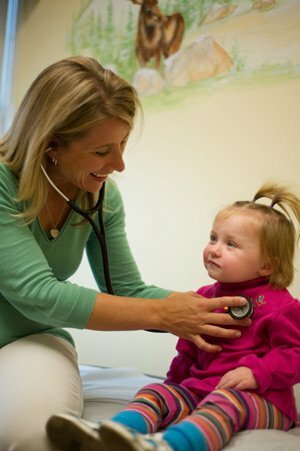 For after hours care, our doctors are available when your child needs the advice and care of a pediatrician.